Working in the startup world, I come up with ideas for web apps all the time, and while it can be fun to cobble together a product in my head and imagine how it would succeed, to imagine myself bowing to imaginary applause, I know in my heart it’s really just, as Ze Frank had put it: Brain Crack. Brain Crack is the novel or movie script knocking around in your head that you haven’t started writing yet. It’s the web app without a line of code to its name. It’s that “slam dunk” million-dollar-business that you’ll “eventually” get to starting. Because these ideas are so perfect in your head, you hesitate to get started on them, knowing that the end product will often be disappointing in comparison to what you had originally dreamed up. So you sit, do nothing, and dream. The idea is simple enough: let’s create a deals site with a game layer. A working title for the site is deal-roulette.com (Domain is available last I checked, but hyphenated domains are tacky anyway). Essentially the user experience would be very similar to a game of Russian Roulette (minus the dire consequences!). The user inputs their credit card information before they play the game and then cycle through five or six deals. Each time they choose another deal, there’s an increasing likelihood that the user will land on the “must buy” deal. If that happens, they will have automatically purchased said deal. 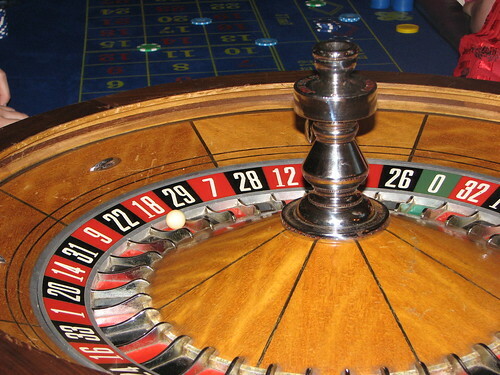 Obviously, for branding issues, it might be a good idea not to use the word “Roulette” so as not to associate the the site with such a violent game. Non-registered users would be welcome to play a “practice round” of the deals game with the deals from last week. For the practice round, there wouldn’t be any rewards or risks involved, but this way they can familiarize themselves with the rules of the game as well as with the quality of the deals. I imagine that it wouldn’t take long to develop a project like this. An experienced Rails developer could probably put together a prototype within a week or so. Setting up a payment gateway with a business model such as this might get a little tricky considering the legal issues around online gambling that might arise, but once that hurdle is cleared, you’d be good to go. The real difficulty is the business development side. Signing five to six deals a week would require at least two to three folks working the phones full-time. It’s a saturated space, so the sales team would run into a lot of initial resistance from daily-deal weary merchants. This is why it’s probably best to focus on niche markets that haven’t been covered so much by giants like Groupon, Living Social and the army of deal site clones. Although there are many complexities that I’m not addressing in this short blog post, random discounted trips to exotic locations could be a possibility. Travel Roulette’s biz dev team could get in touch with a few travel agents and ask them about last minute deals and post them on the site. Travel Roulette would provide those tickets at a steep discount, offering the travel agents a cut, and the thrill-seeking 20 somethings interested in playing “spin the globe” could play the same game online. Since apps are a lot cheaper than plane tickets (not to mention the fact that there are no location constraints), I was thinking that each non-loaded app would be either FREE or extremely cheap (25 cents to 50 cents). However, within these deals was a much more expensive app at its full price (anywhere from $5.00 to $10.00). Users would both enjoy the thrill of getting a deep discount on some great apps for very cheap or even free while risking a possible $10.00 purchase. Obviously this is just an idea, not a working product, but I believe that there’s something to it. I’d love to hear your comments about whether or not something like this would work. I’m a little busy with my job hunt and my current project to get started on a project of this size, so if you’d like to run with the idea and develop it, please be my guest! Interesting idea. Had a similar idea for daily deals but stopped at your same problem point: getting enough daily deals. I’m not sure how well the roulette mode would apply to a daily deal site, but I think there are lots of other “idea” where the roulette/random mechanic could make for a great and fun app.